The sun lies at the heart of the solar system, where it is by far the largest object. It holds 99.8 percent of the solar system's mass and is roughly 109 times the diameter of the Earth — about one million Earths could fit inside the sun. A huge solar filament snakes around the southwestern horizon of the sun in this full disk photo taken by NASA's Solar Dynamics Observatory on Nov. 17, 2010. The sun and its atmosphere are divided into several zones and layers. The solar interior, from the inside out, is made up of the core, radiative zone and the convective zone. The solar atmosphere above that consists of the photosphere, chromosphere, a transition region and the corona. Beyond that is the solar wind, an outflow of gas from the corona. The core extends from the sun's center to about a quarter of the way to its surface. Although it only makes up roughly 2 percent of the sun's volume, it is almost 15 times the density of lead and holds nearly half of the sun's mass. Next is the radiative zone, which extends from the core to 70 percent of the way to the sun's surface, making up 32 percent of the sun's volume and 48 percent of its mass. Light from the core gets scattered in this zone, so that a single photon often may take a million years to pass through. The convection zone reaches up to the sun's surface, and makes up 66 percent of the sun's volume but only a little more than 2 percent of its mass. Roiling "convection cells" of gas dominate this zone. Two main kinds of solar convection cells exist — granulation cells about 600 miles (1,000 kilometers) wide and supergranulation cells about 20,000 miles (30,000 km) in diameter. The photosphere is the lowest layer of the sun's atmosphere, and emits the light we see. It is about 300 miles (500 km) thick, although most of the light comes from its lowest third. Temperatures in the photosphere range from 11,000 F (6,125 C) at bottom to 7,460 F (4,125 C) at top. Next up is the chromosphere, which is hotter, up to 35,500 F (19,725 C), and is apparently made up entirely of spiky structures known as spicules typically some 600 miles (1,000 km) across and up to 6,000 miles (10,000 km) high. After that is the transition region a few hundred to a few thousand miles thick, which is heated by the corona above it and sheds most of its light as ultraviolet rays. At the top is the super-hot corona, which is made of structures such as loops and streams of ionized gas. The corona generally ranges from 900,000 F (500,000 C) to 10.8 million F (6 million C) and can even reach tens of millions of degrees when a solar flare occurs. Matter from the corona is blown off as the solar wind. The strength of the sun's magnetic field is typically only about twice as strong as Earth's field. However, it becomes highly concentrated in small areas, reaching up to 3,000 times stronger than usual. These kinks and twists in the magnetic field develop because the sun spins more rapidly at the equator than at the higher latitudes and because the inner parts of the sun rotate more quickly than the surface. These distortions create features ranging from sunspots to spectacular eruptions known as flares and coronal mass ejections. 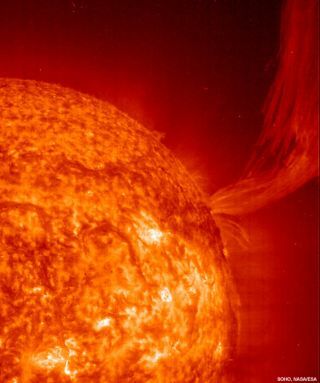 Flares are the most violent eruptions in the solar system, while coronal mass ejections are less violent but involve extraordinary amounts of matter — a single ejection can spout roughly 20 billion tons (18 billion metric tons) of matter into space. Just like most other stars, the sun is made up mostly of hydrogen, followed by helium. Nearly all the remaining matter consists of seven other elements — oxygen, carbon, neon, nitrogen, magnesium, iron and silicon. For every 1 million atoms of hydrogen in the sun, there are 98,000 of helium, 850 of oxygen, 360 of carbon, 120 of neon, 110 of nitrogen, 40 of magnesium, 35 of iron and 35 of silicon. Still, hydrogen is the lightest of all elements, so it only accounts for roughly 72 percent of the sun's mass, while helium makes up about 26 percent. See how solar flares, sun storms and huge eruptions from the sun work in this SPACE.com infographic. View the full solar storm infographic here. The number of sunspots varies as solar magnetic activity does — the change in this number, from a minimum of none to a maximum of roughly 250 sunspots or clusters of sunspots and then back to a minimum, is known as the solar cycle, and averages about 11 years long. At the end of a cycle, the magnetic field rapidly reverses its polarity. Ancient cultures often modified natural rock formations or built stone monuments to mark the motions of the sun and moon, charting the seasons, creating calendars and monitoring eclipses. Many believed the sun revolved around the Earth, with ancient Greek scholar Ptolemy formalizing this "geocentric" model in 150 B.C. Then, in 1543, Nicolaus Copernicus described a heliocentric, sun-centered model of the solar system, and in 1610, Galileo Galilei's discovery of Jupiter's moons revealed that not all heavenly bodies circled the Earth. To learn more about how the sun and other stars work, after early observations using rockets, scientists began studying the sun from Earth orbit. NASA launched a series of eight orbiting observatories known as the Orbiting Solar Observatory between 1962 and 1971. Seven of them were successful, and analyzed the sun at ultraviolet and X-ray wavelengths and photographed the super-hot corona, among other achievements. In 1990, NASA and the European Space Agency launched the Ulysses probe to make the first observations of its polar regions. In 2004, NASA's Genesis spacecraft returned samples of the solar wind to Earth for study. In 2007, NASA's double-spacecraft Solar Terrestrial Relations Observatory (STEREO) mission returned the first three-dimensional images of the sun. NASA lost contact with STEREO-B in 2014, which is remained out of contact except for a brief period in 2016. STEREO-A remains fully functional. One of the most important solar missions to date has been the Solar and Heliospheric Observatory (SOHO), which was designed to study the solar wind, as well as the sun's outer layers and interior structure. It has imaged the structure of sunspots below the surface, measured the acceleration of the solar wind, discovered coronal waves and solar tornadoes, found more than 1,000 comets, and revolutionized our ability to forecast space weather. Recently, NASA's Solar Dynamics Observatory (SDO), the most advanced spacecraft yet designed to study the sun, has returned never-before-seen details of material streaming outward and away from sunspots, as well as extreme close-ups of activity on the sun's surface and the first high-resolution measurements of solar flares in a broad range of extreme ultraviolet wavelengths. There are other missions planned to observe the sun in the next few years. The European Space Agency's Solar Orbiter will launch in 2018, and by 2021 will be in operational orbit around the sun. Its closest approach to the sun will be 26 million miles (43 million km) — about 25 percent closer than Mercury. Solar Orbiter will look at particles, plasma and other items in an environment relatively close to the sun, before these things are modified by being transported across the solar system. The goal is to better understand the solar surface and the solar wind. The Parker Solar Probe will launch in 2018 to make an extremely close approach to the sun, getting as near as 4 million miles (6.5 million km). The spacecraft will look at the corona — the superheated outer atmosphere of the sun — to learn more about how energy flows through the sun, the structure of the solar wind, and how energetic particles are accelerated and transported.